A portrait of a young Jewish woman by the Austrian artist Gustav Klimt is expected to fetch up to £18m when it is auctioned in London later this month. The sale follows the restitution of the painting to its subject's heirs. Painted in 1902, the portrait of 19-year-old Gertrud Loew was left behind when Loew, fearing Nazi persecution, left Vienna for the US in 1939. The portrait came to be acquired by Gustav Ucicky, a film-maker who made propaganda for the Nazis. 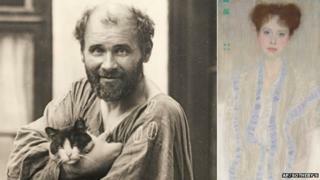 Ucicky, considered to be Klimt's first illegitimate son, collected a number of Klimt's works that he left to his widow when he died in 1961. Ursula Ucicky established the Klimt Foundation in 2013, which reached an agreement with Gertrud Loew's family last year over her portrait's ownership and sale. The painting - originally commissioned by Anton Loew, a physician who treated Klimt at his private sanatorium - will be sold at Sotheby's in London on 24 June. In its online catalogue, the auction house describes the piece as "an extraordinarily beautiful and captivating work from a crucial period in the artist's career". The restitution to its rightful owner of a Klimt painting that was looted by the Nazis was the subject of a recent film, Woman in Gold, starring Dame Helen Mirren.